Check out our latest article in the Jewish Link of New Jersey! 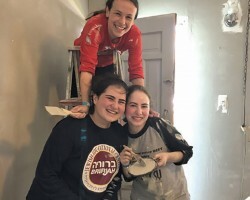 As part of their summer vacations, 10 students from Bruriah participated in the six-day New Jersey NCSY Girls Mission to Puerto Rico—Fred and Rose Distenfeld Chesed Missions to help rebuild areas of Puerto Rico damaged by Hurricane Irma in 2017. The students were part of a larger group of 25 made up of students from Bruriah, Ma’ayanot, The Frisch School and various public schools. The students were accompanied by Sarah Kesler, college guidance counselor at Bruriah, and Rabbi Andrew Markowitz of Bruriah and his wife Dr. Sara Markowitz. “Puerto Rico was an experience like no other. I’ve learnt so much about myself and the nature of other people and I’m really sorry it’s over,” said Maya Ratner (Bruriah, ‘19). The students volunteered for activities as varied as handing out teddy bears, cookies and drinks to children in Escuela Manuel Gaetan Barbosa in San Juan, to weeding a garden on Abner’s Farm “Finco El Reverdecer” in Ponce, Puerto Rico.